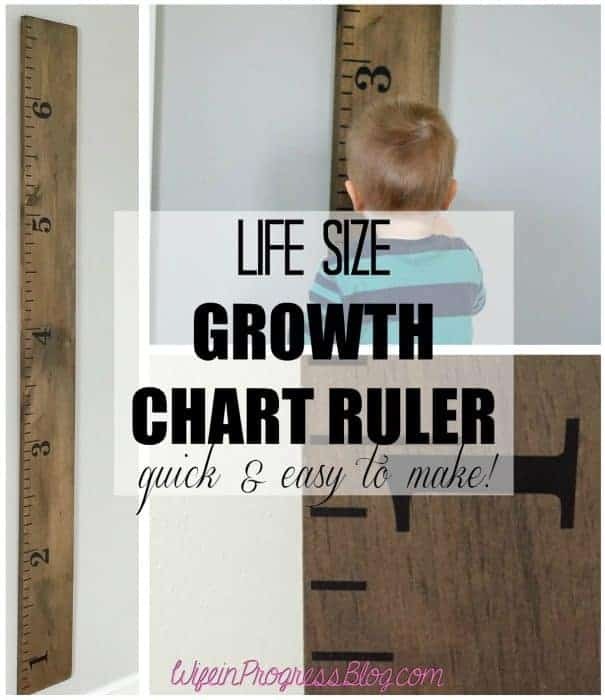 This sweet life size ruler is the perfect way to measure your kids’ height as they grow. Hang it on a wall and mark those height milestones as they meet them! Cian was born at the 98 percentile for weight and has never deviated from it! 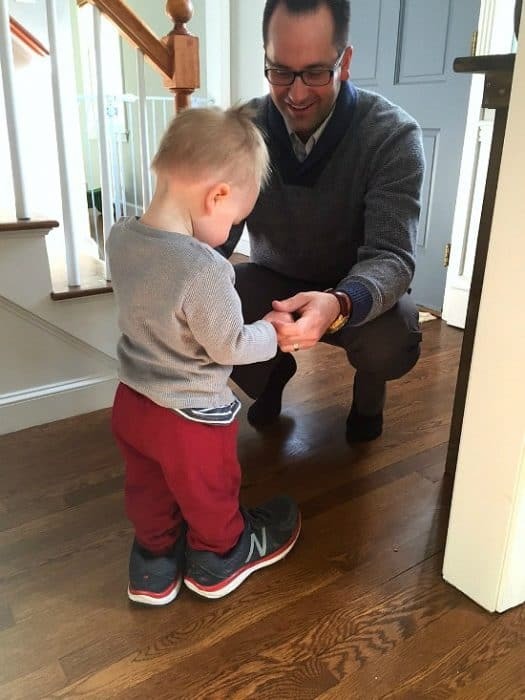 His Daddy is pretty tall and I am on the short side (OK, very short side!) so his height is definitely not from me! And despite all Cian’s food allergies as a baby, he has thrived. 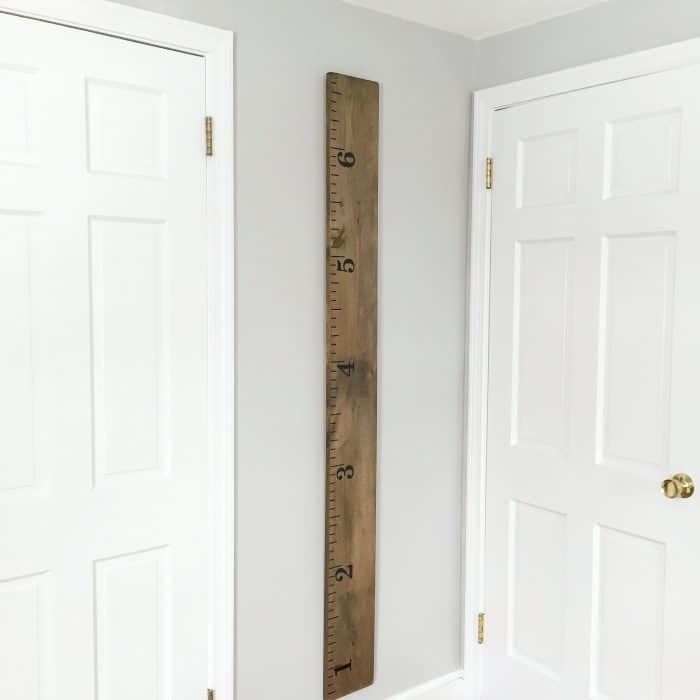 Did your parents measure your height by marking it on a wall or door in your home? Mine didn’t but my husband’s parents did. The marks are still written on the kitchen wall! Isn’t that the sweetest? I wanted to do something similar for Cian but knowing that I will probably paint the wall a dozen times before he’s a teenager, I needed something that wasn’t permanently attached and that could be brought with us in case we ever moved. 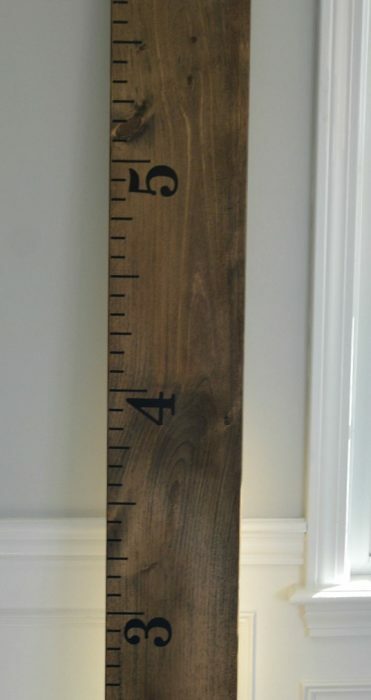 And that is how my idea for this life size growth chart ruler was formed! It was quick and easy to make and only cost $25! 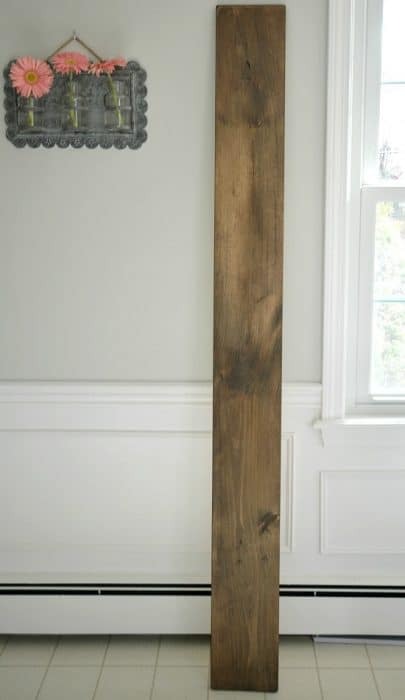 Stain or paint your board. If you stain it, you’ll need to wait 48 hours before applying tick marks and numbers. Paint only needs 24 hours to fully dry. I also like to sand the edges of my board to give a more finished look as well as to round the top and bottom edges. 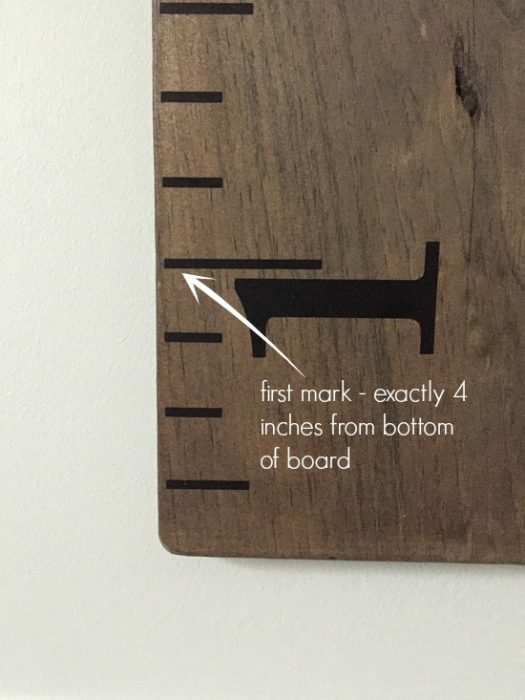 The ruler is designed to hang 8 inches off the floor, so you will want to mark the first spot for your tick mark 4 from the bottom of your board. This means the first measurement will be 1 foot. Using a pencil, light mark the board. After your first mark, add another light mark to your board every 12 inches. The 6 marks you made will account for every foot, for a total of 6 feet. Now, all you have to do is attach the decals. The ones I purchased were cut into strips so all you had to do was align them to the pencil marks, smooth them down and pull back the transfer paper. All in all, applying the vinyl tick marks took 10 minutes. Once all the tick marks are applied, the last step is to place the numbers on. You can orient them vertically or horizontally, whatever’s your preference! In order to hang it up in Cian’s room, I attached a sawtooth hanger to the back. Isn’t Cian’s new Life Size Ruler adorable? A healthy baby is one that will grow big and tall so we’ve got to keep measuring those milestones! Can you tell me where you bought the decals or tell me the website. I also tried the link and its not working. Hi Karen – try this: http://rstyle.me/n/b75akdb5v87 and use code CYBER30 for 30% off for cyber monday! Tried both links (in the instructions and email response) for where you bought your vinyl decals and it didn’t work for me. Has anyone else had that problem? No – I’ve had lots of people buy them. I just checked the link again and it’s working fine. I’m not sure why it’s not working for you. You can try again by clicking here. I hope it works – let me know if you’re still having issues. I love this. Wondering how the vinyl is holding up since you made this? Hi Sarah! It’s still perfect! 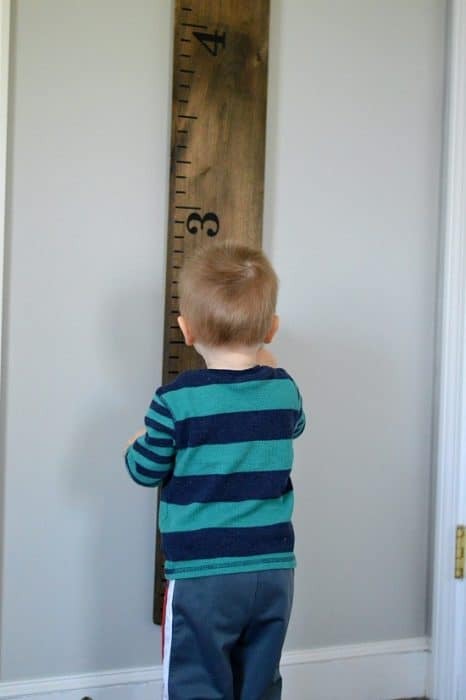 We mark my son’s growth every couple of months with a sharpie and he regularly tries to “measure” his own height. It’s the perfect addition to his little bedroom! Where can I purchase the vinyl decals? Hi Rachel, I purchased these ones(aff). They were only $13 and were shipped super quickly!